Welcome to our complete guide to finding the best hamster maze! You family will love watching your little pet finding his way around the hamster maze to win a treat. Caitlin shows you how to make or choose the best maze for your syrian or dwarf hamster. You might have thought about adding play tubes and other contraptions for your hamster to navigate in his cage, but did you know that you can purchase a maze? That’s right – mice aren’t the only animals that enjoy a good maze (especially the treat at the end)! In this article, we’ll talk about the various types of hamster mazes, including wooden mazes, mazes that you can put in Hammie’s cage, tube mazes, and even mazes that you can make yourself! You’ll find some fun videos to watch too! Maze for hamster – what kinds of mazes are available? Hamster maze designs range from free-standing to those that are contained within a hamster cage or carrier. If your hamster has play tubes in his habitat, then you may be familiar with using tubes to create a tunnel system or a maze. Similarly, chewable cardboard mazes can be placed in hamster habitats or carriers for additional enrichment. Furthermore, various plastic or wooden mazes (which may also be chewable) are available for use either inside or outside of the cage. The freestanding varieties are typically much larger than the mazes that can be placed in habitats. We’ll get into a few examples of hamster mazes in the following sections. Hamster in maze = pea in its pod. 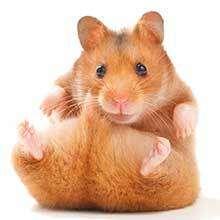 Hamsters are curious little dudes who need activities and lots of exercise to keep them from becoming bored and getting into mischief. Furthermore, highly active hamster breeds, such as Dwarfs and Roborovskis, love to self-exercise, so providing them with enrichment activities, such as mazes, will kill two birds with one stone, so to speak. 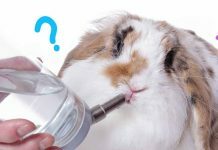 What mazes are suitable for Syrian and Dwarf hamsters? A hamster in a maze is adorable, for sure, but a hamster that’s too large for a maze isn’t adorable. In fact, he may very well be in danger! Different types of mazes are better suited for different types of hamsters. For example, we do not recommend tube mazes for large hammies, like Syrians (also known as ‘Golden’ or ‘Teddy’ hamsters). Especially large members of this breed may become stuck in the tubing! Regardless of their size, if your hamster friend will chew on the plastic connectors between the tubes, then we advise against tube mazes altogether. Should Hammie succeed in chewing through the connector when you’re not looking, he might very well escape! Additionally, large hamsters should not be put in maze-cage hybrids that are too small. We discuss large hamster cage requirements here. 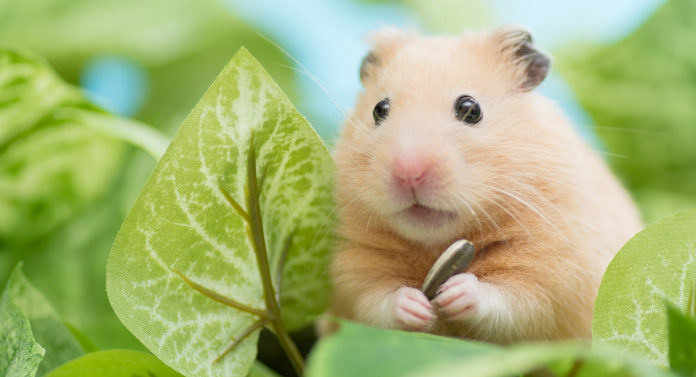 If you have a Dwarf hammie, then you’ll likely have plenty of maze options to choose from. With their tiny size, you won’t have to worry about Dwarfs getting stuck in tubes. They are also the perfect size for many maze-cage or maze-carrier hybrids. Furthermore, a Dwarf may be less destructive than a Syrian hamster on chewable mazes. Kaytee Puzzle Playground for Small Animals – This adorable little playground or maze will make the perfect addition to your current dwarf hamster cage! Made of durable plastic, the 42 individual puzzle pieces can be snap-locked together into just about any playground or maze that you can think of! The pieces are also compatible with other Puzzle Playground products, making this a lovely expandable toy! 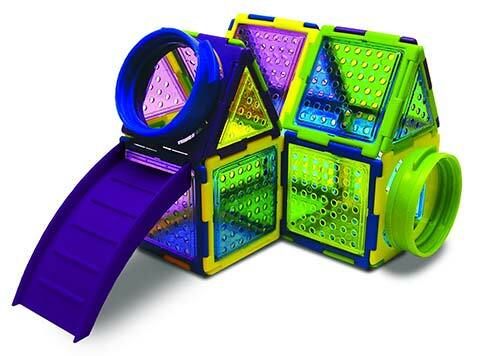 Great option for hamsters that are children’s pets – your little ones will love creating different mazes for Hammie! The Playtime Reconfigurable Maze is a supremely large maze that’s also interchangeable! It’s made of high-quality wood that’s been covered in toy-grade paint. 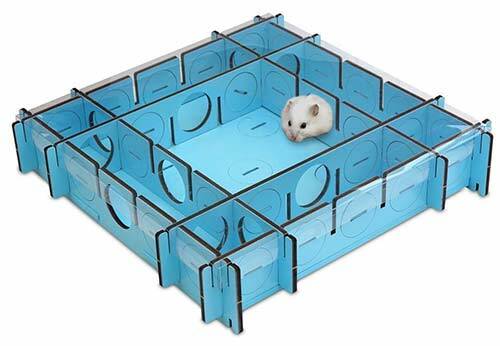 The 12-inch by 12-inch square contains 25 cells that can be configured into countless maze patterns, and a plastic lid ensures that Hammie can’t escape. However, what makes this maze super cool is the fact that it can be expanded both vertically and laterally! That’s right – you can build this maze into multiple levels for hours of fun for you and your hamster! Because of the paint that covers the walls, we don’t recommend this maze for hamsters who are very active chewers. If you’re searching for a hamster maze that’s both durable and likely chewable, then look no further than a wooden maze! Be sure that the maze is made of all-natural wood (not cedar or pine, as these are toxic to hamsters) that’s not treated with chemicals or paint before putting your hamster inside, though. 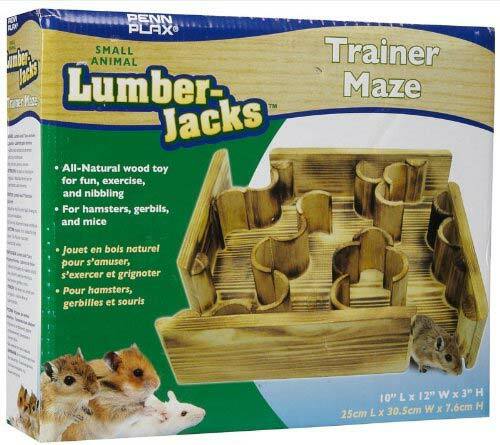 The Penn Plax Lumber-Jack Trainer Maze – is a 10-inch by 12-inch maze is made of all natural, animal-safe, and chewable wood. Its simple design makes it a great starter maze for hamsters that are new to cage toys – just put a treat at the end and watch Hammie find it! Looking for an interactive toy that can be integrated into your hamster’s habitat or cage? If so, a cardboard maze habitat insert could be your (and your hamster’s) new best friend. Cardboard hamster mazes are an inexpensive way to provide your furry friend with hours of entertainment as well as a safe chewing source. They’re often designed to be placed within habitats and carriers as a way to create multiple “rooms” and levels for your pet to explore or nest in. Simply place one cardboard maze into your hamster’s primary habitat for an instantly subdivided, multi-level environment. If you really want to make things interesting, use cage add-ons, such as interlocking tubes (remember to use these for small breeds only), to create a truly enriching and spacious area! This bright pink habitat-maze value pack comes with not just one, but four chewable cardboard mazes. Each maze is decorated with an incredibly cute scene, including a tree house, beach setting, and a doll house. The mazes are designed to fit right into the rounded habitat (one at a time) for hours of climbing, nibbling, or burrowing. Additionally, the 13.5-inch by 12.25-inch by 9-inch habitat is fully compatible with other Habitrail habitats or add-ons, so you can easily expand your hamster’s habitat into something truly extraordinary! If you have a hamster that’s not particularly large and/or that isn’t an aggressive chewer, a cage that can have tubes added on to it can provide a host of opportunities for creating quite a maze! Lots of interconnecting tubes placed in intricate designs, with twists and turns and dead ends, make a super fun way to create your very own maze design! 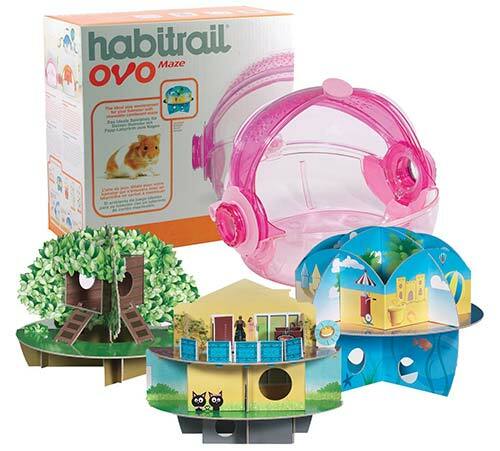 The Habitrail ovo Mini Maze is a maze that can double as a lookout tower for when your hamster reaches the end of a tunnel! It attaches to the outside of a cage that’s compatible with Habitrail add-ons, or it may be attached to the cage indirectly via another tube. The included cardboard maze insert (fully chewable) creates two areas for your pet to observe his kingdom or to climb around, and a retractable door means you can quickly access your pet, if needed. Have you ever thought of making a do-it-yourself (DIY) hamster maze? LEGO hamster mazes are composed of LEGO building block toys, which makes it super easy to create lots of different mazes for your furry friend to navigate. Here’s a video to give you some inspiration, and to help you come up with your own unique system! If you’re not into LEGOs, then you might consider building your own wooden or cardboard hamster maze. There are a few hamster mazes to choose from. But which one is best? To determine which maze to purchase, you’ll need to consider your hamster’s size and his current habitat. Is he too large for a cage that has a tube trail system or an active chewer who might make chew toys out of tube connectors? If so, you might consider purchasing a freestanding plastic (non-toxic) or cardboard maze that can be placed in his cage. Some cages are actually sold with their very own cardboard mazes, of which can turn your hamster’s cage into a two-story house! If your hammie isn’t too aggressive of a chewer, then a pet-safe wooden maze can be placed in a spacious cage for his entertainment. 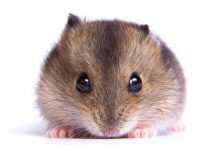 Is your hamster a Dwarf or other small breed? Does she live in a habitat that’s compatible with tubing and add-ons? If she is, then you can use tube tunnels to create a maze both inside and outside of her habitat. When she gets bored with the current setup, simply reconfigure it! 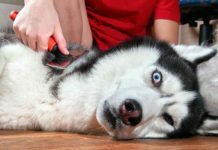 If none of the above mazes sound appealing, the good news is that you can make your own maze out of LEGO toys or pet-safe materials. The options for hamster mazes are endless! Tell us which mazes you have tried and what your hamster enjoy’s best.